Keeping your dog healthy and happy may be easier than you think—and good for both of you. (NAPSI)—Dog owners who are active with their pets often enjoy enhanced health benefits, including lower blood pressure and stress, thanks to the increased physical activity and time spent with their canine companions. According to Dr. Brian Zanghi, research nutritionist at Nestlé Purina Pet Care, dogs should get an average of one hour of physical activity each day, more than twice the minimum recommended time for humans by the U.S. Department of Health and Human Services. 1. Start small—Begin your activity program with short walks, jogs and training sessions at 15-minute intervals. It’s important that your dog understands basic commands to make activity time more enjoyable. Remember to consult your veterinarian and medical professional before beginning any training program. 2. 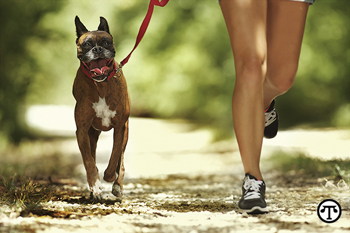 Track your progress—Set daily, weekly and monthly activity goals for yourself and your dog. Purina Pro Plan’s P5 smartphone app (free for iPhone and Android) can be a great tool to track your journey. The app includes training tips that range from basic commands to advanced agility drills. 3. Make it fun—Remember, dogs are naturally playful and enjoy spending time with their owners. Vary your activities and reward your dog with praise and treats during activity sessions. 4. Get the family involved—Take turns as a family walking and training your dog. Include young children to help prepare them for a lifetime of healthy habits. 5. Provide proper nutrition and hydration—A diet high in fat and protein will increase an active dog’s metabolism and his endurance. Let him or her have access to water at all times, especially during long walks or locations away from home. A proper diet can be easier to achieve with the help of dog food designed to help your dog be his best. Purina Pro Plan bioavailable formulas deliver optimal nutrient absorption, with less going to waste. Each Purina Pro Plan product is formulated with an optimal protein-to-fat ratio, to help dogs maintain an ideal body condition based on their breed size, life stage or activity level. You can find further facts and tips on training, feeding and caring for your dog online at www.proplan.com/p5.